Citibank Announces National Digital Banking To Serve Clients Across the U.S.
NEW YORK--(BUSINESS WIRE)--Citi today announced it will launch comprehensive, new mobile capabilities on the Citi Mobile App® for iPhone to serve the full spectrum of client needs nationwide. The range of new features, rolling out in the weeks ahead, will include seamless in-app account opening, a 360-degree view across all financial accounts and spending insights to enhance clients’ financial wellness. In addition, the app will offer a first-of-its kind among banks — non-Citi clients can create a profile and connect their accounts across financial services providers to benefit from the app’s account aggregation, spending insights and bill management features. Capping a transformation that began in 2013, Citi is expanding the U.S. Retail Bank’s reach nationwide with a full suite of new mobile services, having established a strong foundation from which to grow. Citi has streamlined its footprint, redesigned branches, introduced sweeping product enhancements, invested in wealth management, dramatically expanded ATM access and accelerated speed to market with new digital features. A deposit leader in its core markets, Citi comes to market with one of the strongest brands in financial services, industry-leading products, iconic partners, and seamless digital capabilities across banking, credit cards and payments. By taking banking beyond the branch, Citi is well positioned for future growth by both deepening relationships with current customers and expanding to serve new clients nationwide. 87% trust banks more than non-bank institutions when it comes to handling their finances. 79% prefer to use a single app to manage all aspects of their finances, as opposed to using a variety of specialty mobile apps. 87% believe it would be easier to manage their finances with a single view of all their accounts – including those at different banks or financial institutions – in one place. 98% of customers monitor their financial accounts on a monthly basis. 74% are confident that a bank can truly help improve their financial wellness. In-app Account Opening: It’s never been faster or easier to open a new account with Citi. Approved customers may open a bank account entirely within the app, in mere minutes. New mobile customers can begin using their account instantly — no need to wait for a debit card to arrive — and take advantage of our suite of wellness tools immediately. 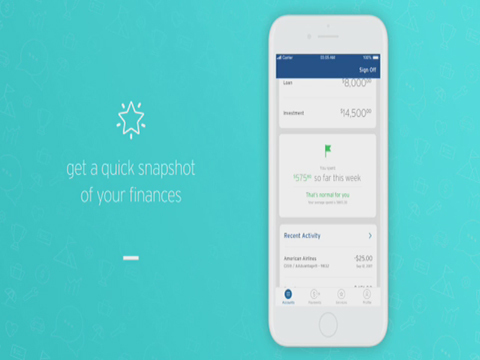 360 Financial View: Citi is the first major U.S. bank with a mobile app that can serve as a single hub for users’ financial lives, eliminating the need for additional financial tracking and budgeting apps. This feature provides customers with a holistic view of their financial lives across their Citi accounts and other financial services providers. Spending Insights: Beyond simply displaying transactions, Citi’s app puts customers’ data to work for them with access to accurate, meaningful insights to build healthy habits that will last a lifetime. This capability helps customers track their monthly spending vs. income, make progress toward weekly spending goals, unlock opportunities to save, and illuminate insights across all their spending. Bill Power: Customers asked us for a more comprehensive, intuitive bill-pay capability and we’ve delivered. Mobile users can easily view their bills – everything from mortgage payments and student loans to gym memberships and streaming video services – not just those they pay with a Citi card. Managing bills is about more than paying them. It’s about being notified when a bill increases and providing customers with full visibility and control over recurring charges. Citi’s new features were developed using agile operating methodology and co-creation with thousands of clients, enabling Citi to deliver the new capabilities within seven months. All of the features went through multiple rounds of research and testing with clients. Additional features will continue to launch in the months ahead. Citi is proud to have been named #1 in Customer Satisfaction for the second consecutive year by the American Customer Satisfaction Index and by Kiplinger’s as Best Bank for High Net Worth Families. The Citi Mobile Banking Survey was conducted by Wakefield Research among 2,000 nationally representative U.S. adults ages 18+, between February 22 and February 28, 2018, using an email invitation and an online survey. The margin of error was +/- 2.2%. © 2015 Citigroup Inc. Citi and Citibank and Arc Design are registered service marks of Citigroup Inc.